Hi everyone! This is Kyle Davis financial advisor with Integrity Financial Group. We are an independent financial planning firm in Orlando, FL. 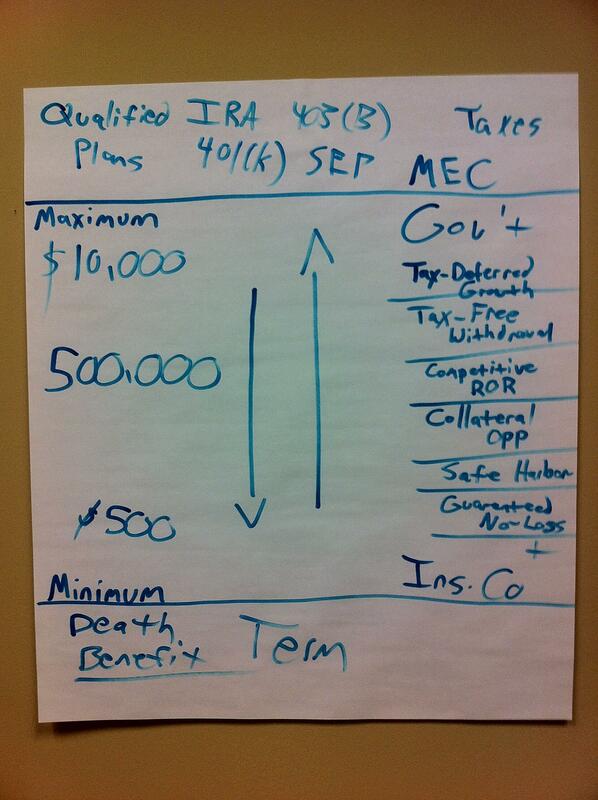 Yesterday, for my “Business of the Month” presentation, I shared the Ten Minute Lesson on Life Insurance. You may recognize the picture below! At the end of my presentation, I had a couple of questions about why a lot of the “Financial gurus” were strongly opposed to permanent life insurance in all of its forms. While I agree that some types of permanent life insurance are not all they are cracked up to be, saying that it’s all terrible is very shortsighted and I believe very unwise. There are a lot of things that these folks say that I agree very strongly with. Dave Ramsey and Suze Ormond and such help a lot of people take positive steps and get their debt/spending under control, but it’s very clear to me that they don’t fully understand life insurance. Like I said when I did the lesson, “After seeing this, you will know more about life insurance that MANY life insurance agents”. One of the biggest reason these folks hate permanent life insurance so much is because they are looking at it completely wrong. They are looking at it from an investment point of view, and don’t understand how to effectively use it. I’ll be the first to tell you, life insurance is not an investment – it is a VERY EFFICIENT SAVINGS VEHICLE that can earn significant compound interest if designed and used properly. Permanent insurance, especially WHOLE LIFE, can provide all of the benefits I talked about at our meeting (look at the list on the right side of the photo) and a lot of others that I didn’t have time or space to write. It is a place to put your money that effectively allows you to become your own bank, and with the build up of cash values over time, you will never have to finance a major purchase ever again for the rest of your life, except maybe a house. This is not speculation, and this is not market-sensitive. This is fact. He makes an investment of $100,000 and earns 20% that year. He makes an investment of $100,000, but uses his cash values in his life insurance policy and also earns 20% that year. Since he’s taking a loan from his policy to get the money out, he has to pay 8% to use that money. He has a net gain of $8,400, but remember the 8% interest? that’s not going to any finance company. It’s going back into his policy, so that’s $8,400 + $8,000…and also, if you have the right kind of insurance, the $100,000 is just a loan AGAINST the policy. It’s still actually inside the contract earning interest, so it could be earning, let’s say 4% interest there. Dave and Suze either don’t understand financing, or they just don’t understand life insurance. I’d be more inclined to think the latter. This type of financial planning has been around for over 100 years. This was what people did before America began our dance of death with Wall Street.